JOHOR BAHRU, 11 Nov. – The first batch of students of FINISAR – UTM special program, completed their studies successfully when they graduated and received their scrolls in the last convocation i.e. UTM 61st Convocation Ceremony. The group consisted of 13 students from various countries which are Malaysia, India and Philippines. All the students are engineers from Finisar Malaysia Sdn. Bhd. Its Vice President and Managing Director of Finisar Malaysia, Yap Suan See said credits must go to the students because they have struggled during their studies while working at the same time. She said the company is planning to set up a collaboration for the Doctor of Philosophy program, as they already have the potential students. 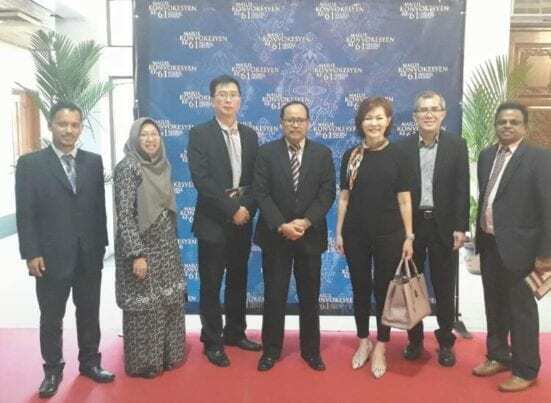 “With the new budget announced by the Government to strengthen research activities at IPT level by allocating RM 400 Million, we hope for good news regarding this,” she said. Finisar-UTM Special Program is a collaboration between the two big names, Finisar and UTM. Based in Ipoh, the program offered was a Master of Computer Science Program, and the students were sponsored by the company. UTM Special Program is an off campus program, and it is a postgraduate study program that is offered on a modular basis and the teleconferencing was conducted on weekends with special fees that was different from the Mainstream Program. This program is implemented to meet the specific demands of an organization or institution which has staff who are interested to pursue their studies while working.